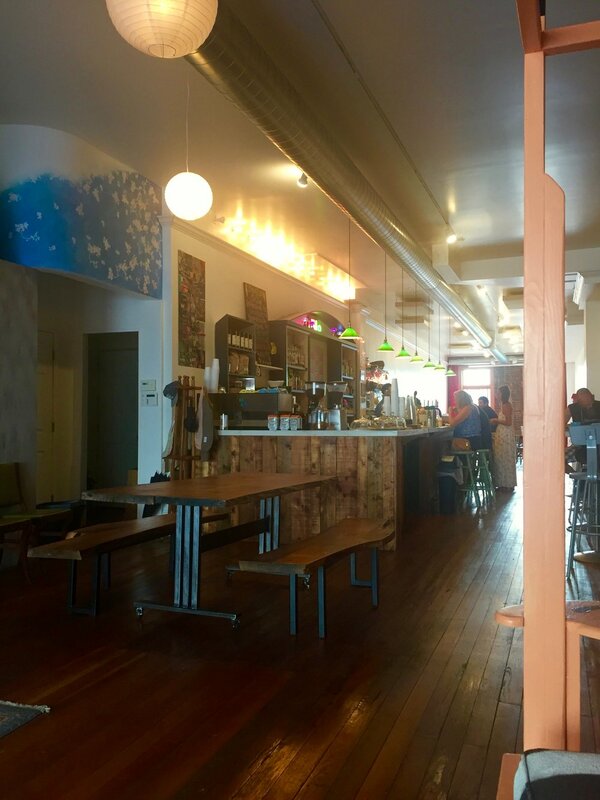 HiLo in Catskill serves superlative coffee, pitch-perfect cocktails, and glorious snacks, and boasts a gallery and performance space featuring well-curated roster of artists and musicians. Opened in spring 2017 by Laura Davidson and Liam Singer, who was the head roaster at Brooklyn's Cafe Grumpy for 7 years, is doing a lot of things at once — and doing them all really well. THE DRINKS: The Smoky Negroni, pictured above, was as warming as a campfire in a glass. HiLo replaces the classic Negroni's gin with mezcal, bringing a smoldering flavor to play off the bitter spice of the campari and the herbal sweetness of the vermouth. 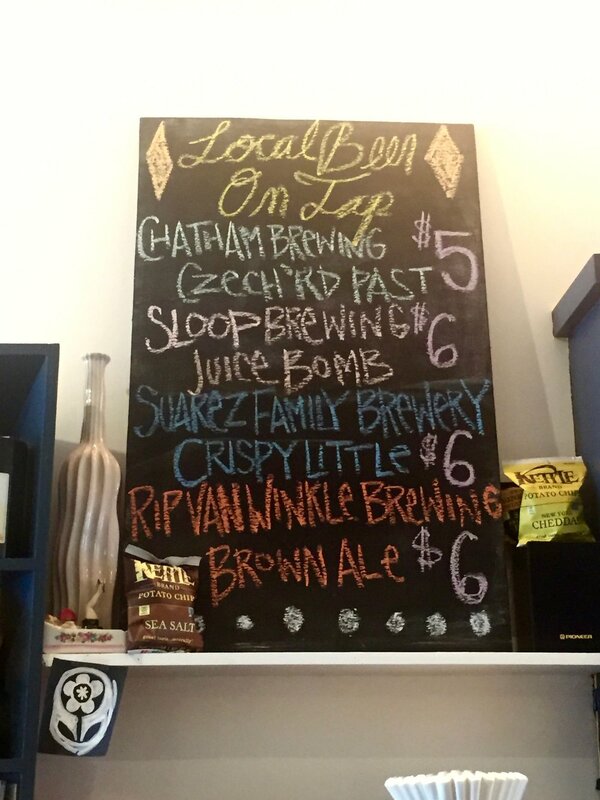 There's a solid local beer list, too, featuring brewers like Chatham Brewing, Sloop Brewing, Rip Van Winkle Brewing, and Suarez Family Brewery. THE FOOD: I could spend every afternoon snacking on this Mediterranean plate, with creamy hummus and labneh, salty olives, a crispy "seed cracker," and fresh carrot and fennel. But the real showstopper on HiLo's carefully curated snack menu is the toasted cheese sandwich on Catskill Bread Co. focaccia with Indian pickle spread from Catskill's own Aryuvedic Atina Foods. 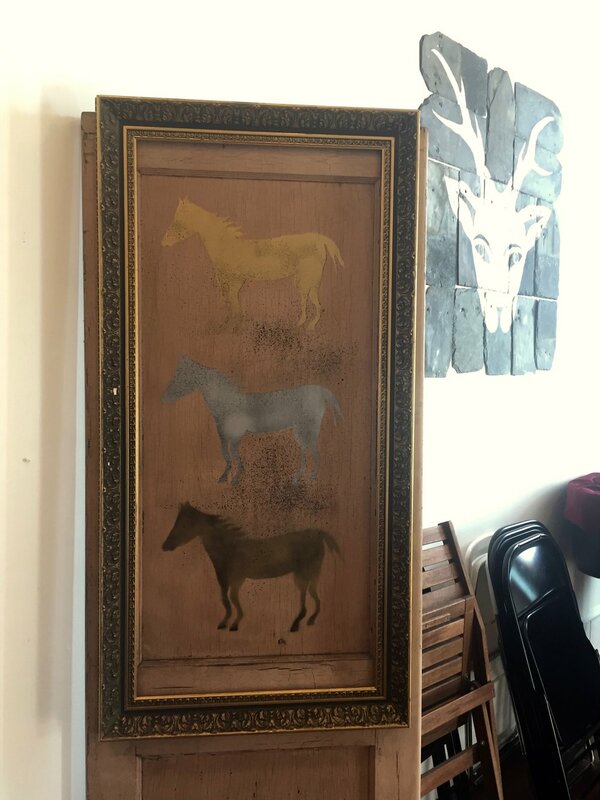 THE ART: In so many coffee shops, the decor seems like an afterthought, but the art at HiLo is as thoughtfully selected as the menu items, and it brings lots of character and warmth to the cafe's long, slim space. We have yet to attend a musical performance here, but you can see some clips from past shows on HiLo's instagram feed to get a sense of their intimate space. My husband suggested making an album cover out of the mountain piece above, a painting by Johnny Abrahams that is part of HiLo's permanent collection. The rest of the art pictured here is from the current exhibition by Ryder Cooley. The list of things below is my favorite part. HiLo is located at 365 Main Street in Catskill, NY. Open Monday and Tuesday 7am to 2pm; Wednesday and Thursday 7am to 10pm; Friday from 7am to midnight; Saturday from 9am to midnight; and Sunday from 9am to 10pm. Hilo's website offers upcoming events, gallery info, a full menu, and some great photos of the space. Follow Hilo on Instagram and Facebook.